Beautifully engraved stock certificate from the United States Playing Card Company issued in 1917. 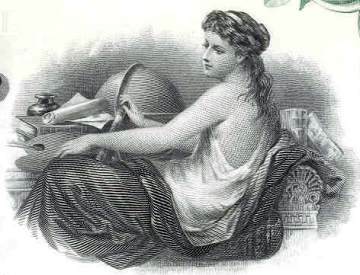 This historic document was printed by the Franklin Lee Division - American Banknote Company and has an ornate border around it with a vignette of the company name next to a woman and a globe. In January 1867, A. O. Russell, Robert J. Morgan, James M. Armstrong and John F. Robinson Jr. formed a partnership and purchased from the proprietors of The Cincinnati Enquirer what was then known as the Enquirer Job Printing Rooms, which occupied the first and second stories of the building at 20 College Street. The firm commenced business as Russell, Morgan & Co., referring to the two printers in the partnership. While on College Street, the firm printed theatrical and circus posters, placards and labels. By 1872, the business had increased so much, it was forced to seek larger quarters, and in November 1872, it moved into a new, four-story building on nearby Race Street. Early in 1880, Mr. Russell proposed to his partners that they embark upon the manufacture of playing cards, an industry monopolized by several East Coast companies. The partners agreed and arrangements were made to add two additional stories to their building, making it six stories high. Many new machines were designed and built expressly for Russell, Morgan & Co. The first deck of playing cards was completed on June 28, 1881. About 20 employees manufactured 1600 packs per day. In 1891, Russell, Morgan and Company became The United States Printing Company. Only three years later (1894), the playing card business had grown to such proportions that it was separated from the Printing Company, becoming The United States Playing Card Company. 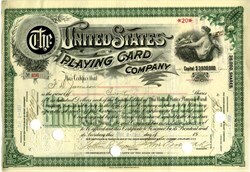 The United States Playing Card Company gained immediate advantages, for it acquired other notable companies: The Standard Playing Card Co (Chicago), Perfection Card Co (New York) and New York Consolidated Cards. NYCC had antecedents dating back to 1833 when Lewis I. Cohen perfected his four-color press for printing playing cards. The famous "Bee Playing Cards," still issued by USPC, had originated at New York Consolidated in 1892. "Congress" is one of the original brands from 1881 still in production today and the card of choice for sophisticated bridge players. Likewise, the world-renowned "Bicycle" playing card brand has been in continuous production since 1885. The Joker � an American invention dating from about 1865 � has made different appearances in the "Bicycle" line. The first type represented a man on a high-wheeled bike. The bicycle later acquired two wheels of normal size. Then followed a series of playing card kings on bikes. These cyclists wheel past a milestone marked "808." Contrary to some opinions, this number has no mystical meaning. It is merely a reference number distinguishing this brand from others (such as "606") by the same company. The Ace of Spades carries another code, identifying the year in which the deck was printed. This Ace features, within the suit sign, a woman who rests her right hand on a sword and shield while she holds an olive branch in her left. The image was inspired by Thomas Crawford�s sculpture, "Statue of Freedom." which, in 1865, had been placed atop the Capitol Building in Washington, DC. By 1900, The United States Playing Card Company expanded again, moving from downtown Cincinnati to a newly-built factory in Norwood. Situated on over 30 acres, the facility would eventually accommodate over 600,000 square feet of manufacturing operations. A Neo-Romanesque bell tower (4-stories high) was built in 1926 atop the company�s 4-story main building entrance. This tower housed a fine set of 12 carillon bells, ranging in size from 1-1/2 to 5-1/2 feet. This was the first set of chimes built for radio broadcasting. The chimes were connected electronically to radio station WSAI, which was owned and operated by The United States Playing Card Company from 1922 until 1930 and located within the USPC complex. The main reason for the radio station was to promote the game of bridge by broadcasting bridge lessons. In those days, there was no limitation on the range of radio power and the WSAI transmission was so clear and strong that it could be picked up as far away as New Zealand. WSAI was eventually sold in the 1930�s to the Crosley Radio Corporation. During World War II, the company secretly worked with the U. S. government in fabricating special decks to send as gifts for American prisoners of war in German camps. When these cards were moistened, they peeled apart to reveal sections of a map indicating precise escape routes. Also during the war, USPC provided "spotter" cards, which illustrated the characteristic shapes of tanks, ships and aircraft from the more powerful countries. The company further assisted by sewing parachutes for anti-personnel fragmentation bombs. The Ace of Spades served a famous purpose in the war in Vietnam. In February, 1966, two lieutenants of Company "C," Second Battalion, 35th Regiment, 25th Infantry Division, wrote The United States Playing Card Company and requested decks containing nothing but the "Bicycle" Ace of Spades. The cards were useful in psychological warfare. The Viet Cong were very superstitious and highly frightened by this Ace. The French previously had occupied Indo-China, and in French fortunetelling with cards, the Spades predicted death and suffering. The Viet Cong even regarded lady liberty as a goddess of death. USPC shipped thousands of the requested decks gratis to our troops in Vietnam. These decks were housed in plain white tuckcases, inscribed "Bicycle Secret Weapon." The cards were deliberately scattered in the jungle and in hostile villages during raids. The very sight of the "Bicycle" Ace was said to cause many Viet Cong to flee. In 1986, the company acquired Heraclio Fournier, S.A., the largest playing card manufacturer in Europe. In 1987, USPC acquired Arrco Playing Card Company, the third largest playing card manufacturer in the country. International Playing Card Company, a Canadian subsidiary of USPC since 1914, maintained its own manufacturing operation from 1928 to 1991. Currently, International Playing Card Company is a sales and marketing organization located in Ontario. The United States Playing Card Company was acquired by a series of new owners: Diamond International in 1969, Jessup & Lamont in 1982, Frontenac in 1989. In late 1994, however, after a long and tedious struggle, Company Management, along with some local investors were ultimately victorious in accomplishing a buyout. The ownership of The United States Playing Card Company was finally returned to Cincinnati.